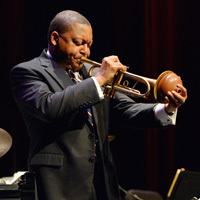 Cal Performances presents international jazz ambassador, nine-time Grammy winner, and Pulitzer Prize recipient Wynton Marsalis and Jazz at Lincoln Center Orchestra at the Hearst Greek Theatre. The band is joined by charismatic pianist and music director of The Late Show with Stephen Colberts house band, Jon Batiste, for a program celebrating the legacy of Duke Ellington, including early Cotton Club jump classics, big band ballads, and selections from Ellingtons lushly orchestrated suites. Jazz at Lincoln Center Orchestra with Wynton Marsalis and special guest Jon Batiste perform Celebrating Duke Ellington Sunday, September 23, 2018 in the Greek Theatre.